Outer ring fordrawncup needle roller bearings(DC type) is made of cold rolled steel strip accurately formed.Structure of DC needle roller bearings features space saving and higher capacity.They are suitable for applications with limited space and housing not hard enough to act as raceway. No requirement on axial location when the DC needle roller bearing is pressed into the housing. 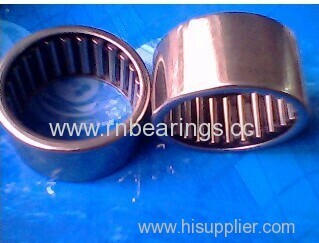 In most applications inner ring is not necessary for DC needle roller bearings unless shaft raceway is impractical,standard inner rings for DC to compare with open end DC needle roller bearings, close end DC needle roller bearings are good for sealing at the close end of bearings,operating temperature range for bearings grease lubricatedare 20℃ to +120℃. without a ring gauge as the thin-walled outer ring can be out of round due to the manufacturing process. bore which must be manufactured with the recommended tolerance limits. gauge must correspond to that given. b. Measure the enveloping circle diameter with cylindrical go and no-go gauge plugs.